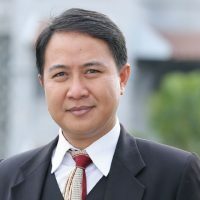 Nama dan Gelar Hilman Latief, M.A., Ph.D.
2014 Alumni Achievement Award Winner of the College of Arts Sciences Western Michigan University (WMU), USA. 2014 Best Lecture Achievement Award awarded by the Rector of Muhammadiyah University of Yogyakarta. Latief, Hilman. “Marketising Piety through Charitable Work: Islamic Charities and the Islamisation of Middle Class Families in Indonesia,” in Filippo Osella and Daromir Rudnyckyj (eds. ), Religion and the Morality of Market (Cambridge: Cambridge University Press, 2017). Latief, Hilman. (Editor), “Rediscovering Peace: Religion, Culture and Politics in the Age of Crisis, (Yogyakarta and Kuala Lumpur: LP3M UMY and Perdana Global Peace Foundation/PGPF-Malaysia, 2016). Latief, Hilman. Comparative Religion in Medieval Muslim Literature (Jakarta: The Directorate of Higher Education, the Ministry of Religious Affairs, 2012). Menelaah Gerakan Modernis-Reformis Islam melalui Kota Gede: Pembacaan Seorang Antropolog Jepang, Studia Islamika 20, no. 2 (2013), pp. 377-392. ISSN: 0742-6763. Accredited journal by the Ministry of Education. “Kemiskinan dan Perkembangan Konsep Kesejahteraan: Studi tentang Gerakan Filantropi di Muhammadiyah,” (Poverty and the Development of the Concept of Welfare: A Study of the Philanthropic Movement of the Muhammadiyah) Ijtihad: Jurnal Wacana Hukum Islam dan Kemanusiaan (STAIN Surakarta), Vol. 7, No. 1 (June 2007), pp. 57-88. ISSN: 1411-9544. “Kemandirian, Solidaritas Sosial dan Kerelawanan: Pemaknaan Filantropi dalam Masyarakat Minoritas Muslim, Kasus Australia dan Singapora” (Independency, Social Solidarity and Voluntarism: Philanthropic Activism among Muslim Minority in Australia and Singapore) Al-Wasathiyyah, International Center for Islam and Pluralism/ICIP Volume 2 Number 9 (2007). “Kemiskinan dan Kedermawanan: Memaknai Ideologi Kesejahteraan” (Poverty and Charity: A Redefinition of Welfare Ideology), Maarif, 2 No 1 (January 2007), pp. 142-158. “Memaknai Kembali Pelayan Sosial Muhammadiyah (Muhammadiyah’s Social Service: A Reconsideration), Maarif, 2 No 3 (Marc 2007), pp. 32-38. “Literatur Muslim Abad Pertengahan tentang Agama dan Sekte: Sebuah Survey Awal,” (Medieval Muslim Literature on Religions and Sects) Essensia: Jurnal ilmu-ilmu Ushuluddin (IAIN Sunan Kalijaga Yogyakarta), Vol. 7, No. 2 (Juli 2006), pp. 143-163. ISSN: 1411-3775. “Sampai Kapankah Muhammadiyah Bisa Bertahan: Beberapa Catatan dan Refleksi tentang Pembaharuan Muhammadiyah" (Notes and Reflections on Muhammadiyah’s Socio-Religious Reforms), Inovasi, No. 4 TH. XIV / 2005. ISSN 0215-7160, pp. 88-96. “Post-Puritanisme Muhammadiyah: Studi Pergulatan Wacana Keagamaan Kaum Muda Muhammadiyah 1995-2002” (Post-Puritanism: A Study of Muhammadiyah Youth’s Religious Discourse 1995-2002), Tanwîr, 1, No. 2, July 2003, pp. 43-102. “Agama dan Identitas Ras: Refleksi Teologis Malcolm X dan Martin Luther King Jr. tentang Tuhan dan Manusia,” (Religion and Racial Identity: Theological Reflection of Malcolm X and Martin Luther King Jr. on God and Human Beings), Relief (Universitas Gadjah Mada) No 1, January 2003. pp. 83-108. ISSN 1673-203X. “Makanan dan Spiritualitas: Telaah terhadap wacana dan Tradisi Agama-agama” (Food and Spirituality: an Examination of Religious Traditions), Tarjih, No. 4, July, 2002, pp. 10-25. ISSN 1410-332X. “Kontribusi Teoretik Strukturalisme Linguistik dalam Wacana Hermeneutika Al-Quran” (Theoretical Contribution of the Linguistics Structuralism in the Discourse of Quranic Hermeneutics) Mukaddimah(Kopertais DIY) No. 10. VII 2001, pp. 53-69. ISSN 0853-6759. “Agama Madani, Negara dan Ligitimasi Multikultural di Indonesia“ (Civil Religion, State, and Multi-Cultural Legitimization in Indonesia) Media Inovasi, No. 4 TH. X / 2001. ISSN 0215-7160, pp. 78-82. “Pergeseran Gagasan ‘Islam Kultural’ di Indonesia: Mencari Arah Baru Tradisionalisasi, Purifikasi dan Modernisasi“(The Shift of ‘Cultural Islam’ in Indonesia: Searching for a New Direction of Traditionalization, Purification, and Modernization), Perspektif, No. 2/ III/2001. “Kritisisme Tekstual dan Relasi Interkontekstualitas dalam Interpretasi Teks Al-Quran” (Textual Criticism and Inter-contextual Relation in Interpreting Quran), Media Inovasi, No. 2 TH. X / 2000. ISSN 0215-7160, pp. 101-110. (Speaker), Seminar on “Islam and Charities in Indonesia,” Muhammadiyah International Forum, Oxford Center of Islamic Studies, University of Oxford, UK, June 2016. (Speaker), Seminar on “Islam and Cultural Diversity in Indonesia,” Muhammadiyah International Forum-, Southampton University, Southampton, UK, June 2016. (Speaker) International Conference on Religion and Development in Southeast Asia, Kyoto University and Consortium for Southeast Asian Studies in Asia, December 12-13, 2015. (Invited) Guest Lecture at Nanzan University-Nagoya and Sophia University-Tokyo, October 2015. (Invited Speaker), “Continuity and Change in the Studies on Islamic Charities in Indonesia,” International Conference: Dynamics of the Studies on Indonesian Islam: Tribute to Karel Steenbrink and Martin van Bruinessen, Pascasarjana Universitas Islam Negeri Sunan Kalijaga Yogyakarta November 18-19, 2014. (Invited Speaker) Public Lecture on “Islamic Charities, Transnationalism, and Globalization,” Western Michigan University, Oct 23 2014. (Invited discussant/contributor), “Conference of 100 year Caritas,” July 2-4, 2014, Vught and Tilburg University, the Netherlands, funded by CORDAID. (Invited Speaker), “Islamic Renewal, Philanthropy and Citizenship,” Cosmopolis Conference: The Making of Religious Traditions in the Indonesian Archipelago: History and Heritage in Global Perspective (1600-1940), Gadjah Mada University in cooperation with Leiden University, 20-22 June 2014. (Speaker), “Transnational Islamic Charities, Dakwah and Globalization,” Public Lecture (panel with Prof. James W. Morrison-Boston College), co-hosted by the Faculty of Islamic Studies-Muhammadiyah University of Yogyakarta, AIFIS (American Institute for Indonesian Studies), LP3M, and Afkaruna Journal, 17 June 2014. (Speaker), “Philanthropy and Muslim Citizenship in Post New Order Era,” KITLV-IIAS Seminar, Leiden, 18 September 2013. (Speaker), “Establishing Patronage or Promoting Collective Changes? The Political Networks of Islamic Charities and the Politics of Development in Indonesia,” the International Conference on Religion and the Politics of Development: Priests, Potentates and “Progress”, 28 - 29 August 2013, Singapore. (Convenor, with Z. Zainal Mutaqin), Conference on Islamic Humanitarianism: Voices and Experiences from Southeast Asia, 26-27 July 2013, co-sponsored by the Graduate School of Muhammadiyah University of Yogyakarta, the International Committee of the Red Cross (ICRC), Dompet Dhuafa, and LAZISMU. (Invited Speaker), “Encountering Domestic Needs: The Presence of International Islamic Relief Organizations in Indonesia,” International Workshop on Philanthropy, Globalization, and Non State Welfare, the University of Hong Kong, 6-9 December 2012. Sponsored by The Hong Kong Institute for Humanities and Social Sciences (HIHSS), The University of Hong Kong. (Speaker), In Search of a New Social Concern for the Public Good: Muhammadiyah’s Philanthropic Activism and Social Entrepreneurship, International Research Conference on Muhammadiyah (ICRM) on “Discourse on the Search for a Renewed Identity of Muhammadiyah for this post Centennial Era,” Sponsored by The University of Muhammadiyah Malang, East Java, 29 November -2 December 2012. (Speaker), “Islamic Philanthropy and Community Development,” The Ministry of Religious Affairs, Ciamis-District, West Java, 28 November 2012. (Invited Speaker), “Elderly, Charity, and Religion,” International Workshop on Elderly Society and Development, Co-sponsored by AUSAID, The Asia Foundation, Surveymeter, The University of Indonesia, and Gadjah Mada University, 20-21 November 2012. (Invited Guest Lecture), “Islamic Philanthropy and Education,” Post Graduate Program, STAIN Salatiga, 23 October 2012. (Invited Speaker), “Shaping Islamic Humanitarianism: Lessons from Islamic Relief NGOs in Indonesia,” International Seminar on Islam and International Humanitarian Law, hosted by the Facullty of Shari’a and Law, the State Islamic University-Sunan Kalijaga Yogyakarta, and co sponsored by the ICRC (International Committe of the Red Cross) and Mizan Publishing, 15 May 2012. (Speaker), “How Does the Private Sector Engage Social-Welfare Enterprises? : Corporate (Islamic) Philanthropy in Indonesia,” International Workshop on Charities and Legitimacy of Organizations, Law, Accountability, and Transparency, Bogazici University, Turkey 12-18 December 2011. Sponsored by The Hong Kong Institute for Humanities and Social Sciences HIHSS), The University of Hong Kong. (Invited Speaker), “The Making of Social Islam: Welfare, Dakwa and Politics,” Symposium on Islam and Muslim Societies, Leiden University Center for Islamic Studies, 23 March 2011. (Invited Speaker), “Medical Charities, Disaster Relief, and Public Healthcare: Faith-based Health NGOs in Post Disaster Aceh and Nias,” International Workshop on Medical Charities in Asia and Middle East, 29 November – 3 December, 2010, Georgetown, Penang, Malaysia. Sponsored by The Hong Kong Institute for Humanities and Social Sciences (HIHSS), The University of Hong Kong. (Presenter/speaker) “Islam and Humanitarian Affairs: The Muslim Middle Class and New Patterns of Social Activism,” International Conference on Islam in Comparative international perspective,” (co-)sponsored by Indonesian Young Leader Programmes-Leiden and Center for the study of Islam and societies-UIN Syarif Hidayatullah, Bogor, 26-30 January 2011. (Guest Lecture) “Islam in Indonesië” in Indonesiëcursus 2009 held by KITLV on November 6 2009 in Vrye Universiteit, Amsterdam. (Presenter/Speaker), “Internationalizing Local Aid: Charity Activism, Social Solidarity and Islamic Movement in Contemporary Indonesia Islam,” presented in the First International Graduate Student Conference on Indonesia, Gadjah Mada University and Academy Professorship Indonesia in Social Sciences and Humanities (KNAW-AIPI), December 1 – 4, 2009. (Speaker/presenter), “Religion and Welfare Activism: Philanthropic Associations in Indonesia,” Summer Schools, Religion, Culture and Society at Univerisair Centrum Sint-Ignatius Antwerpen (UCSIA), Belgium, 1st – 8th Sept 2008. (Speaker/presenter) “Searching for the ‘True Islam’: An assessment to the selected Islamic books inside the university-based Halaqah and their impact on youth culture,” International Conference on Muslim Youth as Agents of Change, Batu-Malang, 26-29 November 2007. (Speaker/presenter) “Poverty and Social Responsibility in Indonesian Islam: The Prospect and Limits of Muhammadiyah’s Charitable Institutions,” Research Seminar, Religion and Globalization Friend or Foes?, Yogyakarta 23-26 May 2006, co-sponsored by the Center for Religious and Cross Cultural Studies, Gadjah Mada University, and led by Prof. Farid Essack and Prof. Paul Knitter. (Speaker/ presenter) “Fight for the Public Sphere: Liberal vis a vis Conservative Muslims (Lessons from Indonesia),” Regional Meeting American Academy of Religion, Midwest Conference, 8-9 April 2005, DePaul University, Chicago, IL. Latief, Hilman. “Philanthropy and “Muslim Citizenship” in Post-Suharto Indonesia,” Southeast Asian Studies, Vol 5, No. 2 (August 2016), pp. 269-286. Published by Center for Southeast Asian Studies, Kyoto University. Latief, Hilman. "Contesting Almsgiving in Post-New Order Indonesia," American Journal of Islamic Social Sciences, vol. 31, No. 1 (Winter 2014), pp. 16-50. Latief, Hilman. “The Politics of Benevolence: Political Patronage of Party-based Charitable Organizations in Contemporary Indonesian Islam,” Al-Jamiah: Journal of Islamic Studies, Vol. 51, No. 2 (2013), pp. 91-118. Accredited journal by the Ministry of Education. Latief, Hilman. “Islamic philanthropy and the private sector in Indonesia,” Indonesian Journal of Islam and Muslim Societies, Vol. 3, No. 2 (2013), pp. 175-201. Latief, Hilman. “Islamic Charities and Dakwah Movements in a Muslim Minority Island: The Experience of Niasan Muslims,” Journal of Indonesian Islam, Vol. 6, No. 2 (December 2012), pp. 221-244. Accredited journal by the Ministry of Education. Latief, Hilman. “Symbolic and Ideological Contestation over Humanitarian Emblems: The Red Crescent in Islamizing Indonesia,” Studia Islamika 18, no. 2 (2011), pp. 249-286. ISSN: 0742-6763. Accredited journal by the Ministry of Education. Latief, Hilman. “Health provision for the poor Islamic aid and the rise of charitable clinics in Indonesia,” Journal of Southeast Asia Research, 18, 3 (September 2010), pp. 503-553. Published by SOAS-University of London. Latief, Hilman. “Youth, Mosques, and Islamic Activism: Islamic Source Books in University-based Halaqah,Volume 5, No. 1 (2010), 63-88. Latief, Hilman. “The Identity of Shi’a Sympathizers in Contemporary Indonesia: An Overview,” Journal of Indonesian Islam, Vol. 1 No. 3 (Dec 2008), pp. 300-335. Published by the State Institute of Islamic Studies, Sunan Ampel-Surabaya. Latief, Hilman. “Developing Cross-Sector Coherence: Islamic Philanthropy, Agenda of Third Sector Organization and Civil Society in Indonesia (bilingual),” Special issues on Discourse of Zakat Management: Between Government and Civil Society, Journal of Zakat and Empowering, Volume 1 (Sya’ban 1429/August 2008), 48-61. ISSN 1979-9349. Amelia Fauzia (2013), Faith and the state: A history of Islamic philanthropy in Indonesia (Leiden, Boston: Brill, 2013), in Journal of Pacific Affairs­, Vol. 88, No. 1 (2015), pp. 231-233. Nakamura, Mitsuo (2012), The Crescent Arises over the Banyan Tree: A Study of the Movement in Central Javanese Town, c. 1910-2010, 2nd Enlarged Edition (Singapore: ISEAS, 2012), in Studi Islamika, Jakarta 2013. Harmsen, Egbert (2008), Islam, Civil Society, and Social Work: Muslim Voluntary Welfare Associations in Jordan between Patronage and Empowerment. Amsterdam: Amsterdam University Press, in American Journal of Islamic Social Sciences, Volume 26, Winter 2009, pp. 106-109. Irfan Abubakar & Chaider S. Bamualim (eds.) (2007), Filantropi Islam & Keadilan Sosial: Studi tentang Potensi, Tradisi, dan Pemanfaatan Filantropi Islam di Indonesia (Jakarta: UIN Syarif Hidayatullah), in Kultur: The Indonesian Journal for Muslim Cultures, Volume 4, Number 1, 2009. “Minority Groups and Islamic Humanitarianism,” The Jakarta Post, July 05, 2013. “Politik Global dan Kader Perdamaian” (Global Politics and Peace Generation), Republika, June 3, 2013. “Cosmopolitan Muslims: Between Rural and Urban Area,” The Jakarta Post, August 29, 2009. “Muhammadiyah Intellectuals Need Meaningful Dialogue," The Jakarta Post, July 20, 2005. “Revisiting the Key Concepts of Muhammadiyah,” The Jakarta Post, July 1, 2005. “Syafii Maarif, Moderation and the Future of Muhammadiyah,” The Jakarta Post, May 28, 2005. “Agama dan Ruang Publik: Antara Profanisasi dan Sakralisasi” (Religion and the Public Sphere: Between Profanization and Sacralization), Kompas, February 27, 2005. “Muhammadiyah and Interfaith Discourse,” The Jakarta Post, December 13, 2004. “Mengkaji Ulang Tradisi” (Rethinking Islamic Tradition), Republika, January 4, 2004. “Menggugat Stagnasi pemikiran Islam” (Rethinking Islamic Thought), Republika, July 18, 2003. “Pernikahan, Konversi Agama, dan Toleransi” (Marriage, Religious Conversion, and Tolerance), Kompas, February 22, 2002. “Jejak Para Nabi: Ziarah k e ‘Kota Suci’ Tiga Agama” (The Journey to Jerusalem) (Part. 1), Suara Muhammadiyah, No. 11/ TH. Ke 87, 1-15 June 2002. Based on traveling to Jerusalem November 2000. “Jejak Para Nabi: Ziarah ke ‘Kota Suci’ Tiga Agama” (The Journey to Jerusalem) (Part. 2), Suara Muhammadiyah, No. 12/ TH. Ke 87, 16-30 Juni 2002. Based on travelling to Jerusalem November 2000. “Sunnah dalam Wacana Imam Syafi’I“ (Imam Syafii’s Discourse of Sunnah) Risalah, 2001. “Visi Sosial Ibadah Kurban“ (Social Vision of Kurban Ritual), Bernas, March 17, 2000. “Melindungi Warga Sipil dari Konflik Kekerasan“ (Protecting Civil Society from Social Conflict), Kedaulatan Rakyat, February 4, 2000. “Masyarakat Kritis Religius” (The Religious Critical Society) Amanat, Edisi 092 TH II, July 27, 2000. “Budidaya Demokrasi dalam Masyarakat Sipil” (The Cultivation of Democratic Culture and the Consolidation of Civil Society) Jawa Pos, Radar Yogya, April 14, 2000.